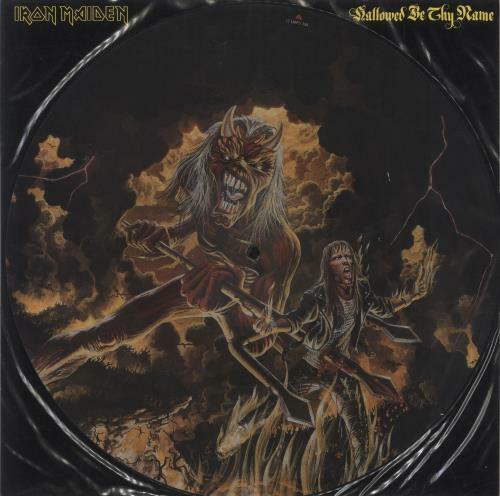 IRON MAIDEN Hallowed Be Thy Name (1993 UK limited edition 3-track 12" Picture Disc single recorded at the Olympic Arena in Moscow in June 1993, also including Wasted Years recorded live in Bremen in April 1992 & The Trooper recorded live in Helsinki in June 1992. The disc features a great image of the Devil Eddie killing Bruce, drawn by Derek Riggs. This was released at the time that Bruce had decided to leave the band, only to return a few years later. The disc is completewith backing card picture insert within a clear PVC sleeve. Both the backing card and the picture disc look almost unused and unplayed 12EMPD288).